Man kind cannot live without a fully functioning refrigerator. Below is an image of a common refrigerator showing the position of parts. Before you can fix your frig. you need to find out what is wrong with it. Your refrigerator does 2 things. First it freezes and refrigerates, then second it defrosts. To do this the cold coil (evaporator) must be able to bring the temperature in the freezer compartment down to 0-10 degrees f.
But to do these things the refrigerators cold coil (evaporator) will have to be very cold. The air going thru the evaperator (cold coil) has the heat taken out and the humidity. This humid air will condense on the cold coil meaning the water in the air will collect on the cold coil. Being that the evaporator is colder than 32 degrees f. the moisture that collects on the evaporator will freeze. Over time this ice build up must be removed or it will freeze so much that air can no longer go thru the coil to be cooled. A symptom of the evaporator freezing up is the air temperature in the refrigerated compartment (where the milk is) is no longer cold. The freezer seems to be semi cold. So that leads us to "defrosting". The way that refrigerators defrost is by using a timer, and an electric heating element. The timers on most frig's let the system run in cooling mode for about 6-8 hours. Then the timer switches from cooling to defrost. When the timer goes into defrost it shuts off the compressor and the fan inside the freezer. Then the electrical heating elements are turned on. While in defrost mode the only things working are the light bulb(s), timer and the electric heating elements. As the electric heaters melt the ice build up on the evaporator the water runs into the water pan under the evaporator (cold coil). Then the water runs into a drain tube that takes the water down to the water pan under the refrigerator. There is a "P" trap (just like the "P" trap under your sink) just before the tubes outlet to the water pan. This is to keep bugs and odors from entering the freezer. The water in the pan is evaporated by the heat from the compressor and the fan under the refrigerator. The refrigerator is in defrost for about 30-40 minutes. The refrigerator's defrost timer allows the compressor and the fan to run as needed (thermostat) for anywhere from 6-8 hours depending on the manufacturer. After 6-8 hours the timer switches the system into "defrost". This is when the compressor and inside fan are shut down. The electric element heaters come on to defrost the evaporator (cold coil). 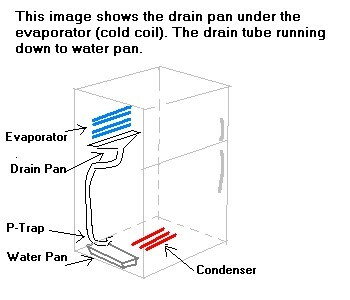 The water runs down to the drain pan under the evaporator (cold coil) then into a rubber tube that drains down into the water pan under the refrigerator where the water evaporates. After defrosting, the refrigerator starts the process over again, refrigerates 6-8 hours-defrosts for 30-40 minutes back and forth. The frig. just doesnt get cold enough anymore. The freezer section is ok but the bottom is warm. There is water inside the frig. that needs to be wiped up constantly. The frig. runs ok but the ice cream wont stay hard. The freezer builds up ice around the door even with the auto door defrost turned on *if equipped*. The frig. sweats on the outside of the doors. The frig. is to cold, my milk is freezing.